Iran and Hezbollah were left out of an annual terrorism threat assessment report offered in late February to the US Senate by Director of National Intelligence James Clapper. Iran and Hezbollah had been fixtures on the annual report before 2015. Iran’s efforts to fight Sunni extremists, including the so-called Islamic State (IS, also known as ISIL or ISIS), were touted in the unclassified version of the Worldwide Threat Assessment of the US Intelligence Communities, released recently. While a US-led coalition has targeted Islamic State in Iraq and Syria, the report noted Tehran’s push to keep “ISIL from gaining large swaths of additional territory” in Iraq. Iran is allied with both the Iraqi and Syrian governments. So, with the US, it has a common foe in Islamic State. In the Middle East, Iran has “intentions to dampen sectarianism, build responsive partners, and deescalate tensions with Saudi Arabia,” the report noted, though it warned that some Iranian actions to “protect and empower Shia communities are fueling growing fears and sectarian responses,” which could hinder regional stability. Hezbollah, a Shiite group based in Lebanon and funded by Iran, has also fought Islamic State militants in both Syria and Iraq, though they are not part of the US-led coalition of 26 nations that has used airstrikes to counter Islamic State’s sprawl in the region. Iran was included in the ‘Terrorism’ section of previous threat assessments, in 2011, 2012, and 2013. The ongoing negotiations between Iran and the US, among other world powers, regarding Tehran’s nuclear program are likely another reason Iran was not included in the threat assessment. Tehran’s exclusion from the terror threat designation is part of Washington’s strategy, Max Abrahms, a member at the Council of Foreign Relations, told Newsweek. According to the Times of Israel, Israeli think tank Meir Amit Intelligence and Terrorism Information Center pointed out that Iran and Hezbollah were considered terror threats in a separate report by the US Defense Intelligence Agency. “Islamic Revolutionary Guard Corps-Qods Force (IRGC-QF) and Lebanese Hezbollah are instruments of Iran’s foreign policy and its ability to project power in Iraq, Syria, and beyond,”the US Defense Intelligence Agency told the US Senate in an assessment also offered on February 26. Meanwhile, talks regarding Iran’s nuclear program are set to resume in Switzerland in the coming days. 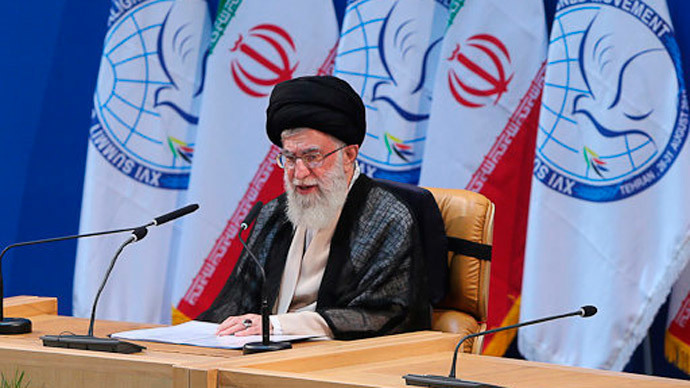 Little is known about the deal being negotiated, but leaked information over the past several weeks indicates that it would allow Iran to develop a civilian atomic program under strict supervision, which would make it very difficult to build a nuclear weapon.